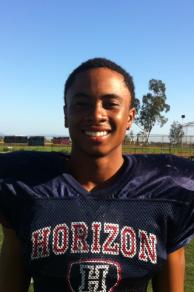 All-Hands Team Member — Darren Carrington Jr. When a team expects an onside kick they send out what is known as the hands-team, a group player most likely to be able to grab and hang onto a short kick before the kicking team can arrive. If there were a hands-team for receivers Darren Carrington Jr. would be on the first team. The 6’3″ 180 lb. receiver from Horizon High School San Diego will bring some unique talents to the Oregon Ducks football team. He has the ability to go get a ball in traffic that every team covets, and he does it with a lot of grace that makes it look easier then it really is. Go up in a crowd and make a one-handed catch? Yep. Need to readjust and reach back for a ball with one hand? No problem. Need to softly pull in a pass on a post pattern without breaking stride? All day long. Watching Darren Carrington’s highlights you will see all of this and more. Oregon has a lot of great receivers. Big receivers like Josh Huff, scary-fast and elusive De’Anthony Thomas, an incoming hurdler with great technique and the ability to run away from a defender in Devon Allen. Every player has a role, and I expect that Darren Carrington’s role, among others, will be the guy you can throw the fade to knowing that he will be a guy who will go and get the ball. It’s hard to put you finger on a specific item but what is most striking is really simple; Darren Carrington makes catching a football look easy. He is so smooth he makes catching the ball look like an after thought. With a long reach and great body control he seems like a player that has a great chance to get snaps as a true freshman. Carrington received dozens of scholarship offers. When offered a Duck Scholarship the morning after completing the Ducks summer camp he didn’t hesitate to accept. While Oregon has always recruited him as a receiver Darren Carrington was also recruited as a corner back by other schools. In a recent high school playoff game Carrington turned in a defensive performance that earned him the Defensive Player of the week. 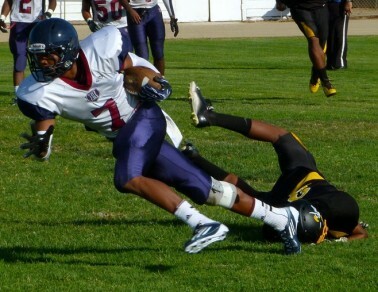 His game stats consisted of a forced fumble, 6 tackles and an 89 yard interception for a touchdown. Carrington’s stock continued to rise with each passing month. There was the impressive performance against other top high school player in July at The Open event put on by Nike in July. At the NIKE Camp in Oakland Carrington came away with the MVP for receivers. He also participated in the Rivals 100 camp in Atlanta. As recently as January he participated in the Semper Fidelis All-American Bowl. Like many of the recruits signed by Oregon, Carrington is a good student reportedly carrying a 3.3 gpa through his Junior year of high school. He plans to study Sports Marketing while at Oregon. Carrington continues the line of Oregon Players whose fathers played in the NFL. His Father, Darren Carrington, played eight years in the NFL. Darren’s mother Vickie also ran track for Northern Arizona University where she met Carrington Sr.
Darren has two sisters. Older sister DiArra plays basketball for New Orleans University while younger sister, high school freshman DiJonai, plays for the Horizon basketball team. Speaking of Oregon Ducks whose fathers played in the NFL, how many can you name? Use the comment section below to list both the father and son.